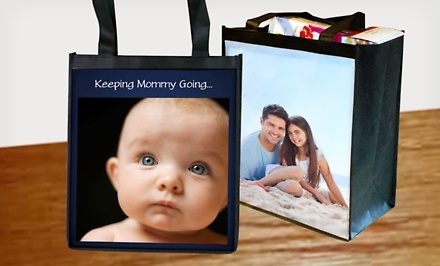 Photos of family, friends, and beloved pets decorate the front and back of reusable grocery bags. MailPix’s online designing tool helps you upload photos and customize each bag’s layout and text. In addition to your photos, the sturdy black bags can bear groceries, picnic supplies, and very small children. The bags are made of recycled PET stitch bond nonwoven fabric Their dimensions are 12” (L) x 6.5” (W) x 13.75” (H). Limit 3 per person, may buy 2 additional as gifts. Limit 1 per order. Valid only for option purchased. Free shipping. Does not ship to AK/HI/Canada/Puerto Rico. Most orders ship within 7-10 days of redemption date. Does not ship to PO boxes. FINAL SALE; no returns. Voucher is non-transferable.